Robert E. Lee is an iconic and controversial figure which countless books have been written about since days of the Civil War. Some of these books are a full account of Lee’s life while others focus solely on specific aspects of his life such as his personal thoughts and opinion’s as expressed in his private papers or his public image and how it came to be what is today. 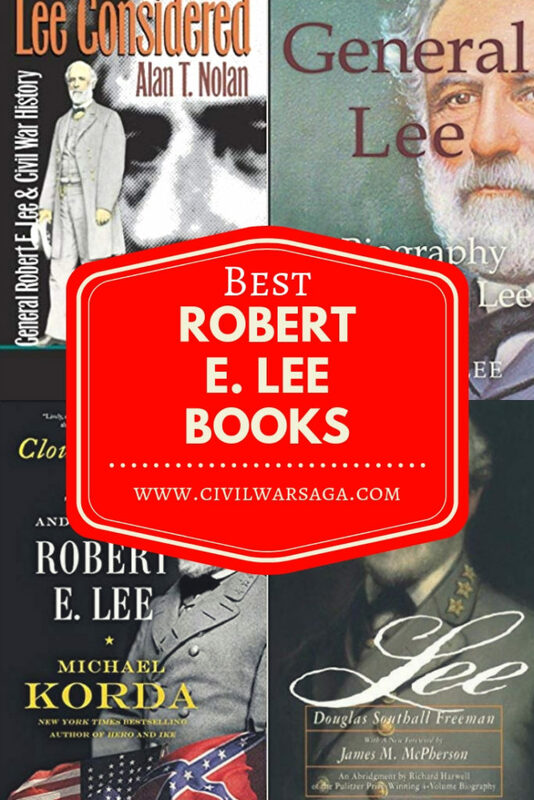 To help you figure out which books to read, I’ve created this list of the best books about Robert E. Lee. These books all have three to five star ratings on sites like Amazon and Goodreads and many of them are best-sellers and have great reviews from critics. I’ve also used many of these books in my research for this website so I can personally say they are some of the best on the topic. Published in 1934, this four-volume book by Douglas Southall Freeman chronicles all of the major events and highlights of Robert E. Lee’s military career. The book is now considered the definitive biography of Robert E. Lee. Douglas Southall Freeman, who died in 1953, was a newspaper editor, military analyst, and a pioneering radio broadcaster. In addition to his biography about Lee, Freeman also wrote a highly acclaimed six-volume biography of George Washington. Freeman won two Pulitzer Prizes, one in 1935 for his biography of Robert E. Lee and one in 1958 (posthumously) for his biography of George Washington. Published in 1995, this book by Emory M. Thomas explores the real Robert E. Lee, not the legend that he became. Thomas argues that Lee’s image has been distorted over the years partly due to his own hidden nature and partly due to the myths and legends that surround him. Emory M. Thomas is Regents Professor of History Emeritus at the University of Georgia. Thomas is also the author of eight books about the Civil War era, which include The Confederate Nation: 1861-1865; The Confederacy as a Revolutionary Experience; Travels to Hallowed Ground: A Historian’s Journey to the American Civil War; Bold Dragoon: The Life of J.E.B. Stuart; The Confederate State of Richmond: A Biography of the Capital; The Dogs of War: 1861; The American War and Peace: 1860-1877. Published in 1904, this book is a collection of documents compiled by Captain Robert Edward Lee, the son of General Robert E. Lee. 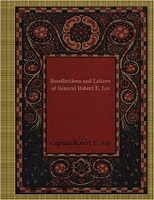 The book covers Lee’s service in the U.S. Army prior to the Civil War, his service in the Confederate States Army, his letters to his family, his life after the war as a private citizen and his opinions on the war and reconstruction as well as his last days before his death in 1870. Captain Robert E. Lee was the youngest of General Lee’s three sons. In 1862, Lee served as a private in the Rockbridge Artillery before he was promoted to the rank of Captain, after the Battle of Sharpsburg, and then promoted to major general and aide-de-camp to Confederate President Jefferson Davis. Published in 2014, this book by Michael Korda is a full-scale biography of Lee’s life and military career. Michael Korda is a British author and former editor-in-chief of Simon and Schuster. Korda has written a number of history books, including Hero: The Life and Legend of Lawrence of Arabia; Alone: Britain, Churchill, and Dunkirk: Defeat Into Victory; With Wings Like Eagles: The Untold Story of the Battle of Britain; Ike: An American Hero; Journey to a Revolution: A Personal Memoir and History of the Hungarian Revolution of 1956. Published in 2015, this book by Jonathan Horn is about Lee’s complicated connection to George Washington. Jonathan Horn is a former speechwriter for George W. Bush and journalist whose writing has appeared in The Washington Post, The New York Times and the Weekly Standard. The Man Who Would Not Be Washington is Horn’s first book. Published in 2014, this book by William C. Davis is about how Ulysses S. Grant and Robert E. Lee became the famous commanders that they were. Yet, Davis goes on to explain that the book still has new information and insight from newly discovered and previously ignored sources, especially on Lee and Grant’s youth. William C. Davis is a retired Virginia Tech history professor and the author of numerous books about the Civil War, including The Cause Lost: Myths and Realities of the Confederacy; Look Away: A History of the Confederate States of America; Jefferson Davis: The Man and His Hour: Civil War Cookbook; as well as other history books. Published in 2007, this book by Elizabeth Brown Pryor takes a closer look at Robert E. Lee through his unpublished private letters. Elizabeth Brown Pryor, who died unexpectedly in an accident in 2015, was a former U.S. Diplomat who worked for the Department of State. Pryor is also the author of Clara Barton: Professional Angel and Six Encounters With Lincoln: A President Confronts Democracy and Its Demons, which was published posthumously in 2017. In 2007, Pryor won the 2007 Jefferson Davis Award and the Richard S. Slatten Award for Excellence in Virginia Biography for Reading the Man and, in 2008, also won the Lincoln Prize and the Richard B. Harwell Book Award. Published in 1894, this book by Fitzhugh Lee, Robert’s E. Lee’s nephew, chronicles Lee’s life using his unpublished private letters. Despite being published over 100 years ago, the book is still a big seller and is highly recommended by fans of Robert E. Lee. Fitzhugh Lee was a general in the U.S. army during the Spanish-American war and a cavalry general for the Confederate States Army during the American Civil War. In addition to General Lee: A Biography, Fitzhugh Lee also wrote another book, titled Cuba’s Struggle Against Spain, as well as an article about General Lee. Published in 1991, this book by Alan T. Nolan debunks the myths and legends about Lee to set the record straight about this iconic figure. Alan T. Nolan is a former lawyer and author of numerous books about the Civil War, including The Iron Brigade: A Military History; Giants in Their Tall Hats: Essays on the Iron Brigade; Rally, Once Again! : Selected Civil War Writings. Published in 1977, this book by Thomas Lawrence Connelly explores how the image of Robert E. Lee has changed since the Civil War. The book was the first to deconstruct the myth of Robert E. Lee and was considered groundbreaking and controversial when it was published. Thomas Lawrence Connelly, who died in 1991, was a professor of history at the University of South Carolina. Connelly wrote numerous books about the Civil War, including The Politics of Command: Factions and Ideas in Confederate Strategy; Autumn of Glory: The Army of Tennessee, 1862-1865; Army of Heartland: The Army of Tennessee, 1861-1862; Civil War Tennessee: Battles and Leaders; God and General Longstreet: The Lost Cause and the Southern Mind. Rable, George C. “The Journal of Southern History.” The Journal of Southern History, vol. 62, no. 4, 1996, pp. 809–811. JSTOR, www.jstor.org/stable/2211160. Thompson, Charles Willis. “Robert E. Lee: A Final Portrait.” New York Times Book Review, 14 Oct. 1934. Thompson, Charles Willis. “Dr. Freeman Concludes his Monumental Life of Lee.” New York Times Book Review, 10 Feb. 1935. Benet, Stephen Vincent. “Great General, Greater Man: Robert E. Lee.” New York Herald Tribune, 10 Feb. 1935. Tate, Allen. “The Definitive Lee.” The New Republic, 19 Dec. 1934. Commager, Henry Steele. “New Books in Review: The Life of Lee.” The Yale Review, vol. XXIV, no. 3 (March 1935), 594. Malone, Dumas. “Review of R.E. Lee.” American Historical Review, vol. XL, no. 3, (April 1935), 534. Malone, Dumas. “Review of R.E. Lee.” American Historical Review, vol. XLI, no. 1, (October 1935), 164. Johnson, David E. Douglas Southall Freeman. Pelican Publishing Company, 2002.